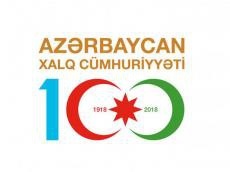 Today.Az - Azerbaijan establishes jubilee medal "100th anniversary of ADR"
A new medal "100th anniversary of the Azerbaijan Democratic Republic (1918-2018)" has been established in Azerbaijan. The medal was established following discussions on amendment to the “Law on Establishment of Orders and Medals of Azerbaijan” at the plenary session of the Parliament of Azerbaijan on May 1. Following discussions, the changes were put to vote and adopted.